A new Dutch catering company is shucking oysters everywhere but behind the bar. camera (Courtesy Oysters XO) A waitstaff member of Oysters XO is armed with buckets for shucking oysters. Raw bars have been a cocktail party standard for years. But a Dutch catering company has taken the stationary staple and turned it mobile. Meet OystersXO, where fresh mollusks mingle among the guests. 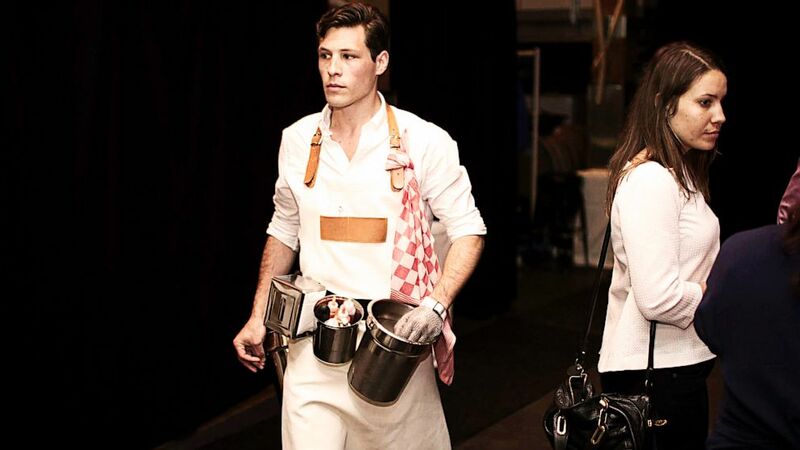 The brainchild of art dealer and Holland expat Rifko Meier, OystersXO outfits a roaming staff in chic shucking gear, including chain-mail gloves, hip buckets full of bivalves and holsters containing accoutrements such as Champagne mignonette or lemon juice for hand-delivered delicacies. "You're not going to get oysters fresher than that," said Meier. An ebullient entrepreneur, Meier launched the company as a lark in New York City in 2012, after a friend asked him if he could bring fresh oysters to a fashion event. But after receiving a positive response to his "oyster girls," he decided to invest seriously in the venture and has since expanded to the Hamptons, Washington, D.C., Baltimore and, most recently, Philadelphia. Satellite outfits will open in Boston and Miami by the end of the year. "I think it's about getting rid of that barrier in between the food server and the guest," said David Beahm, a renowned event designer who has worked with OystersXO on multiple New York fetes. "There's no table, no tray, it's hands on. It's a conversation piece and a conversation starter." The experiential cocktail bite has now been served at parties ranging from a Central Park picnic hosted by the Plaza Hotel in New York to Taste of America with the James Beard Foundation in Philadelphia to a White House Correspondents dinner in D.C. It has even attracted the interest of such celebrity chefs as Jose Andres, whose catering company hired OystersXO for a private event at the restaurateur's home. "Everyone's always looking for the next big thing, and what's going to leave people talking," said Jodi Moraru, owner of Evoke, a Washington, D.C., event-planning company that has also worked with pied pipers, human statues and other hired "characters." "The shuckers are incredibly attractive, so they present very well, their outfits are designed for the specific event and it creates a great photo op." The servers also come equipped with an education in the history and characteristics of various oysters, which are sourced from both the West Coast and East Coast. "We regularly use Kumamoto, which are very buttery, and the Kusshi, which are meaty and a little bit briny, from the West Coast," said Meier. "On the East Coast, I like to use Beau Soleil -- beautiful, small, meaty, very briny with a very fresh, cucumbery aftertaste -- and I love the Cape May, which is a bit more briny." The oyster girls and guys shuck approximately 100 oysters per hour, and come with their own insurance policy, said Meier. "That way, just in case some red-wine mignonette or Tabasco sauce lands on a white dress, we are covered and the guests are covered," he said. "Right now, a favorite among guests is when we make an oyster shooter by shucking the oyster, throwing out the seawater, then drowning the half shell with Bloody Mary mix."